The first thing that pops to mind is Sting and his Synchronicity II – domestic strife, emasculated males and the why of interconnectedness. What is this synchronicity? I have always believed in chance. I always liked to say that “Chance favors the prepared mind” to sound pseudo intellectual. The question ” Am I walking with my eyes fully shut?” Have I missed this fatal Synchronous event? 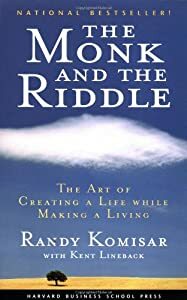 This “ever present reality” coupled with “The Monk and the Riddle” (Randy Komisar) which enlightened me to the “Deferred Life Plan” has created a ground swell of thought. Trying to wrap my mind around the synchronicity of where I am and where I want to be – Komisar speaks of “what is your life passion?” and explains the difference between being driven and being passionate about what one is doing. My father worked all his life and accumulated money, a beautiful home, and….and what? What did he sacrifice or miss out on by choosing to defer his real passion (and what was his passion) till later in life. Which brings my mind full circle because I do not have money, a beautiful home, new cars…I have what Emerson speaks of in American Scholar: a bank account filled with experience. I have stories of my travels, my adventures, my life. So yes Mr. Jung, my eyes are open to the experience of relationships that are not causal in nature – albeit the interconnectedness of positive thought flowing from our minds generates like results. The simple “Ask, Believe, Receive” developing word pictures culminates in experiences that are reverential in nature and as simple as a kiss. Beautiful how something so simple, something so pure can regenerate one’s thinking and one’s confidence! So much I could say. I’ve read this – three times? I looked up Sting’s lyrics. Yes. But… “…my eyes are open to the experience of relationships that are not causal in nature – albeit the interconnectedness of positive thought flowing from our minds generates like results.” In this case, isn’t positive thought *the* cause of like results? WOW! you read it…you are probably the only one. I was hoping someone would read it! And, yes, I read it. It was great! Your cover is blown, Hoss. I’m a big fan of Carl Jung. I liked his view on the collective unconscious, because he believed we are all inter-connected. Too bad he didn’t live to see the internet. That contraption that links us together on a single network, he may have applauded its use. Well said! I never thought of that – internet connect! Found this quote today and thought of you. Went to share it on facebook, but alas… And then it seemed even more appropriate. You say you think outside the box? Have you ever thought of being “Inside the Box”? It could be a nice place to visit from time to time.